A massive new distribution center on Chicago’s Southeast Side will deliver more than 1,300 permanent jobs, according to city estimates, and serve as a transportation and logistics hub for the entire region. Mayor Rahm Emanuel announced plans Sunday for the $169 million project slated for a 196-acre site at 116th Street and Avenue O, just south of the former Republic Steel mill site, where Kansas City-based NorthPoint Development intends to construct six buildings totaling 2.2 million square feet. The facility will complement NorthPoint’s adjacent, 155-acre supplier complex that serves Ford’s nearby assembly plant. Together, the two NorthPoint developments will become the largest industrial park in Chicago, according to the city. The project is slated to receive $25.3 million in tax subsidies to be spent on roads and “related site improvement costs,” said David Reifman, commissioner of the city’s Planning and Development Department. The funding will require approval from the City Council’s Community Development Commission and the Chicago Plan Commission. “It’s certainly been a long time coming,” Reifman said at a press conference Sunday, adding that the project would deliver “head-of-household jobs” for hundreds of residents. In addition to the 1,300 permanent jobs, the city expects the project to create 650 construction jobs. Despite the promise of new jobs, some area activists took issue with the way the project was introduced. Southeast Side residents have for decades raised concerns about their exposure to pollutants from former and existing facilities in the city’s most industrialized corridor. Salazar’s group has spent years creating a Green Economic Industrial Corridor plan, a redevelopment guide for the Calumet River area that aims to protect communities, conserve natural habitats and facilitate sustainable economic development. 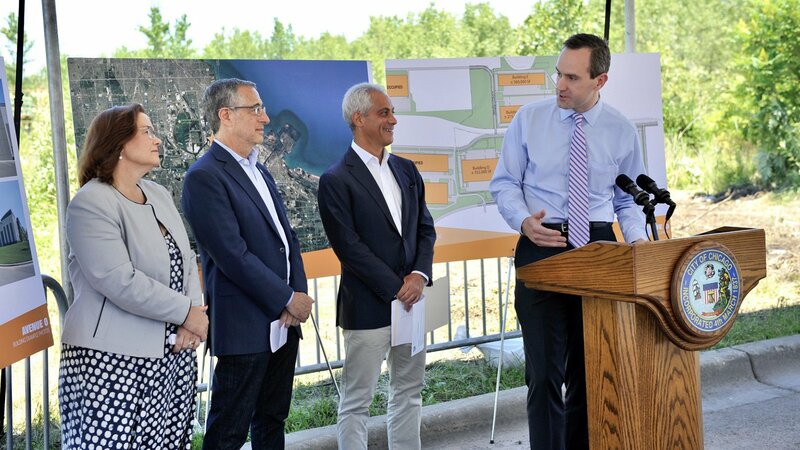 Although the city identified the Calumet River as one of 26 industrial corridors under a new Industrial Corridor Modernization Initiative announced in 2016, the city has thus far focused on redevelopment projects in Pullman and along the North Branch of the Chicago River. Salazar said SETF recently provided 10th Ward Ald. Susan Sadlowski Garza with a copy of its redevelopment guide for the area. Garza, who attended Sunday’s press conference, said the project demonstrates the progress being made to strengthen her ward. She offered a more ambitious projection for jobs than the city, stating that the development would have the potential to create 3,000 jobs.